It was requested for me to do this video, to talk about make up products (easily available at drugstores) that I believe everyone should have in their starter kit! 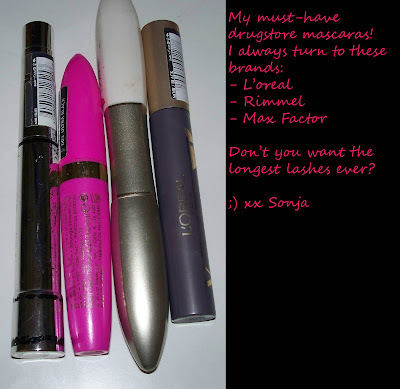 I do like drugstore make up and I believe most of the drugstore brands can stand side by side to most of the high end make up! Why should we spend lots of money on a high end make up, when we can look fabulous even with (in most cases, great quality) drugstore brands! I didn't always have a possibility to shop at Sephora for a high end make up& cosmetics! Especially when I was a student, unemployed or between jobs! I had to be very careful about where& how do I spend my money and I only had make up essentials in my, then non existing, collection. My favourite liquid foundations have always been the ones from Maybelline. I'm quite impressed with the Essence Mosaic powder and Catrice Multi Colour Compact powder. 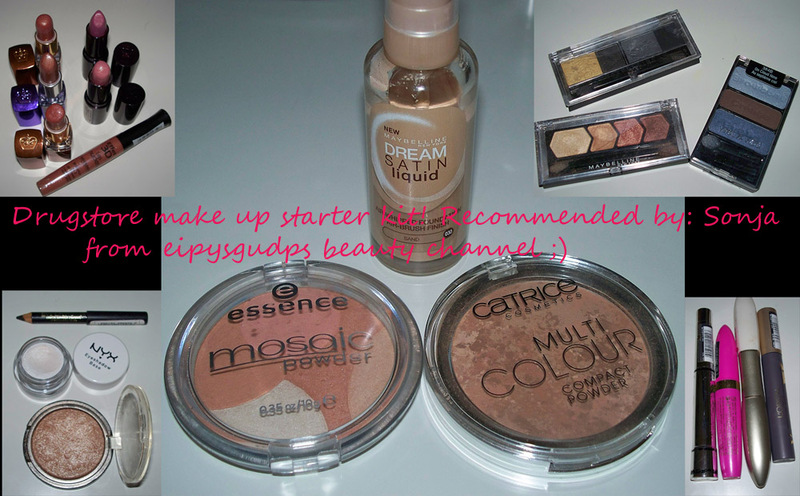 Both of these brands are very affordable price-wise, yet such a good quality! I always go back to L'oreal mascaras! Also, loving the Rimmel's The Max Volume Flash mascara. If you decide to purchase one of many beautiful shades of Bourjois blushes, you won't be sorry! Take my word on that! Bourjois leads when it comes to lip glosses! 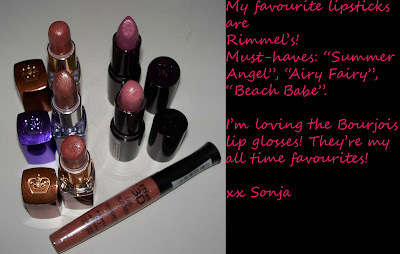 These are a bit harder to find, but I had to mention them! If you're looking for an inexpensive, but good quality mat bronzer, N.Y.C. is the one! I know it can't be find in every drugstore (I don't even know if it's available in Europe), this was a gift from my dear friend Liz from LizYArtur youtube channel, she bought it in the US. Bronzingold has got some very delicate shimmer, but nothing too dramatic, nothing that would stop me from using this bronzer on a daily basis. Whenever I'm travelling, I want to make sure that I'm bringing with me some basic eye shadows; the qualities that I'm looking for are: a good colour pay off & long lasting finish. I don't want to constantly have to re-touch my eyeshadows throughout the day! I need the colours that are perfect for pulling off a day look & also a night, smokey eye look, easily& effortlessly. Girls, I don't know how many of you have tried the Manhattan make up & whether it's available worldwide (uhmmm..probably not :( It's a german brand), but they have the best highlighters ever!!! I have the limited edition one, "Pearls of Tahiti", but every now & then they come up with a similar highlighter. 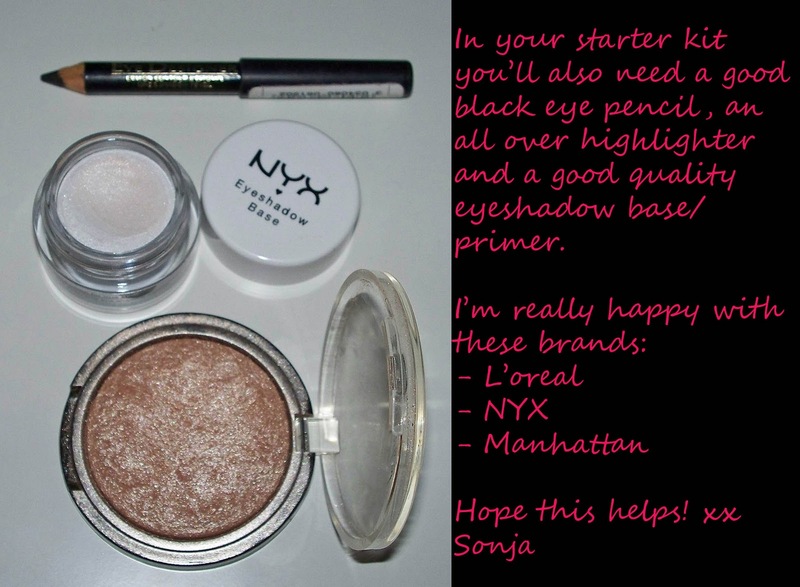 So these are all the products from my starter kit! Let me know, what was in your drugstore starter kit? Any product that you'd like to recommend as your personal favourite& a must-have? ova rimel maskara mi je odlicna cak i mnogo bolja od chanelovih i slicnih..
@ Zorannah Tako je, svi ju hvale tko god ju je probao, odlicna je!Moja je vec stara i iskoristena pa ju moram baciti :( ... ali definitivno ju ponovno kupujem!